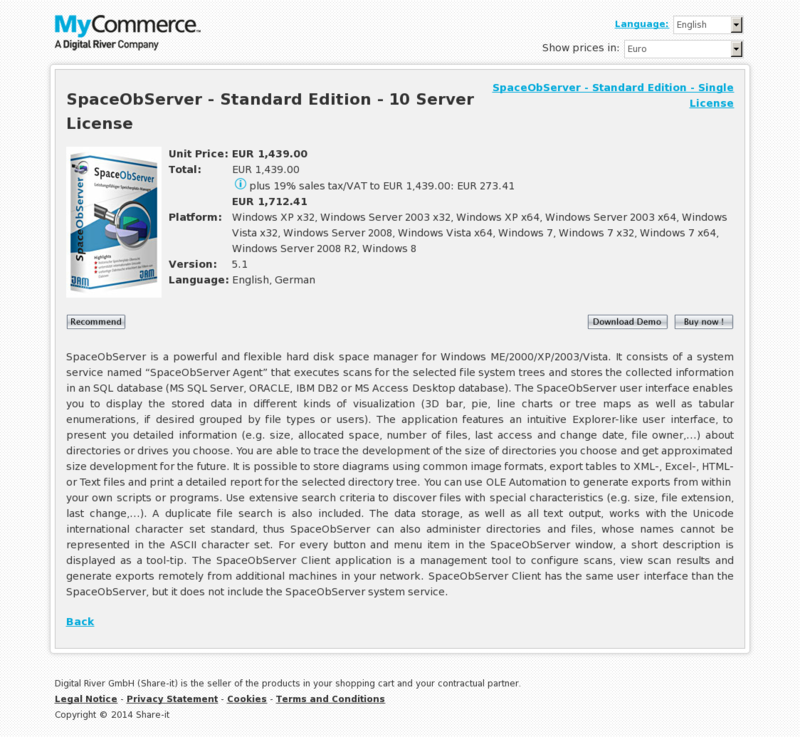 SpaceObServer is a powerful and flexible hard disk space manager for Windows ME/2000/XP/2003/Vista. It consists of a system service named “SpaceObServer Agent” that executes scans for the selected file system trees and stores the collected information in an SQL database (MS SQL Server, ORACLE, IBM DB2 or MS Access Desktop database). The SpaceObServer user interface enables you to display the stored data in different kinds of visualization (3D bar, pie, line charts or tree maps as well as tabular enumerations, if desired grouped by file types or users). The application features an intuitive Explorer-like user interface, to present you detailed information (e.g. size, allocated space, number of files, last access and change date, file owner,…) about directories or drives you choose. You are able to trace the development of the size of directories you choose and get approximated size development for the future. It is possible to store diagrams using common image formats, export tables to XML-, Excel-, HTML- or Text files and print a detailed report for the selected directory tree. You can use OLE Automation to generate exports from within your own scripts or programs. Use extensive search criteria to discover files with special characteristics (e.g. size, file extension, last change,…). A duplicate file search is also included. The data storage, as well as all text output, works with the Unicode international character set standard, thus SpaceObServer can also administer directories and files, whose names cannot be represented in the ASCII character set. For every button and menu item in the SpaceObServer window, a short description is displayed as a tool-tip. The SpaceObServer Client application is a management tool to configure scans, view scan results and generate exports remotely from additional machines in your network. SpaceObServer Client has the same user interface than the SpaceObServer, but it does not include the SpaceObServer system service.